Earlier today Steve Saleen officially announced that after several years of litigation he has successfully regained control of the Saleen brand name and the products he has created and built since 1984. 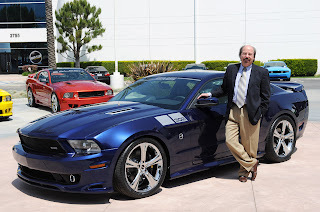 Jim Dvorak, who heads the Saleen Owners and Enthusiasts Club, explains, “There have been some tough times for the members of our community, starting with Steve’s resignation from Saleen, Inc. The company tried to tell us he retired, and even put a positive spin on it, but only some of us knew what was really going on. Most of the company was sold off, and then it changed hands again. Many of our owners and enthusiasts were feeling abandoned and confused, and quite frankly they were misled about what evolved and why. It has been especially confusing for new entrants into the hobby, but also for longtime followers of Steve Saleen who weren’t aware of the day-by-day happenings and didn’t have a direct line to Steve that we have.” SOEC is the officially-recognized organization for the marque, and has been a dedicated force behind Steve Saleen for decades. The return of the Saleen brand will allow Steve Saleen to begin offering all of his current SMS Supercars products under the Saleen flag. With this move, SMS Supercars will be carefully integrated into the Saleen branded family of products. Steve Saleen will also be launching under the Saleen brand its 4V, SC, SSC, and X Models of the 2013 Mustang, 2012 Challenger, and 2012 Camaro ranging from 425hp to over 750 horsepower. These models will have the latest technology in Aerodynamics, Suspension, Braking, and Performance starting at less than $40,000. This is expected to provide a full range of products for all Saleen dealers, speed shops, race teams, and automotive customers in the American Pony Car segment of the performance market. All aftermarket offerings will include Saleen superchargers, SMS superchargers, Saleen and SMS vehicle body components for Mustang, Challenger and Camaro, his signature SMS butterfly hoods, as well as all other interior and engine parts for these vehicles. Having reunited with the Saleen brand, Mr. Saleen is planning to make available all 1984 to present Saleen vehicle aftermarket, replacement and warranty parts. These will be available through the Saleen.com website, by calling Saleen (formerly SMS Supercars) at 800-888-8945, or through the nearest authorized Saleen dealer. Moving forward, Mr. Saleen will have the Saleen Owner’s Registry updated to include all SMS branded vehicles, which will allow them to gain their rightful place in the Saleen family. The Saleen Owner’s Registry is the official record established to maintain the authenticity and exclusivity of all Steve Saleen signature vehicles. Also, the Registry provides the lineage from which a Letter of Authenticity can be requested by an owner, which documents the origin, provenance, and authenticity of each signature vehicle. Additionally, any current owners or dealers of SMS branded vehicles will be provided with replacement badging for their vehicles, if they so desire. They can contact the customer service division of Saleen directly, provide the details on their vehicle, and the replacement Saleen badging will be sent out immediately. This entry was written by by Novocaine (Ford Mustang) and posted here on Monday, April 2nd, 2012 at 5:45 am and is filed under Reviews. This article was not written by us, rather gathered using RSS feeds listed here. We take no credit for this article. You can leave a response, or trackback from your own site.